There’s truth in cliches. Your home is your castle. And in many cases your home is a family’s most valuable asset. A well decorated house can turn your dwelling into a comfortable home. And family portraits create a sense of place and belonging, not just for the adults, but for the little ones too. So, when it comes time to decorate your own personal refuge, what better option is there than to fill the walls with the people and places that you love the most? Family portraits provide timeless décor for any home. They will never become outdated and continue to provide lasting memories. Family portraits are fine art pieces that increase the investment that you’ve already made in your home. And every member of your family can enjoy them each day. But, your family portraits aren’t just an investment in your home, they are an investment in your family too As families grow older, they become busier and seemingly spend less quality time together. Family portraits are a constant reminder of your family connection. And studies have shown that family portraits add to a growing child’s sense of belonging and value as a family member. Moreover, printed photographs do not rely on technology to be displayed. Families who only store their pictures digitally are putting their family history at great risk and they are doing a tremendous disservice to their children. These days, hard drives fail, CD’s and DVDs degrade over time, USB drives and their digital images will not last forever. However, professionally printed photographs are preserved on the finest papers and inks that retain accurate color and are scratch resistant. Professionally printed portraits will last a lifetime and more and will become heirlooms that will someday passed down to your children and grandchildren. But, if you’re like me and my wife, home decoration is hard. It doesn’t matter whether you are hanging one large picture or lots of small ones, determining the right sizes and placement for your artwork can be a bit daunting. Here are some tips to help you get started and make the process a bit easier. One of the challenges for many families is deciding which images to display, especially in this digital age when it easier than ever to capture your most important memories with the click of a button. It’s easy to be sentimental and suddenly you find small pictures cluttering up the shelves, tables, dressers, and bookcases in every corner of your home. The solution is to display your favorite images as a wall collage while preserving the remaining images in books or albums organized by year or by event. Wall collages and clusters come in many forms. The images can be all the same size, or you can print your photographs in multiple sizes and shapes so that they fit together like an intricate puzzle. And the printing options are endless, from traditional framed images, classic canvasses, modern metals, or you can take advantage of a ton of other great products that are available through today’s professional print labs including image pops, acrylics, and image wraps. When hanging art over a couch or piece of furniture, it’s a good idea to design your image or wall collage to fill about ¾ the width of the furniture below. And keep the gap between your images at 6 inches or less. 2”-3” usually looks the best, though larger spaces can handle larger spacing than smaller areas. If you are struggling with how to design a wall cluster for your home, contact me and I can send you some additional tips and examples. I also have software that can show you what your wall art will look like hanging on your walls before you commit. Books and albums are by far the best way to preserve photographs. 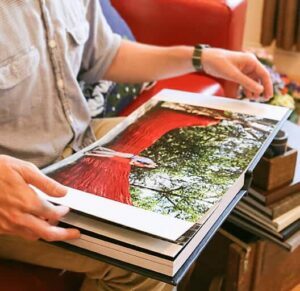 Quality books and albums not only are easy to store on a bookshelf or coffee table, but their hard covers protect your pictures from damage and keep harsh UV light from degrading your images. Just like wall collections, books and albums come in many shapes, sizes and forms. When selecting your own archival photo albums, choose carefully. Avoid albums with adhesive backing that can cause your photographs to tear and degrade. Look for pages that are acid and lignin free. And make sure you purchase albums that use quality plastic like photosafe polypropylene, polyethelene or mylar, not PVC. Of course, these days you also have the option of printing bound photobooks and albums rather than placing loose images into a binder. This is a great option for preserving family events, preserving images for a particular time period or the life-stage of a child. But keep in mind that the design of your album matters. Just like your home and walls, a poorly designed album looks cluttered and is hard to view. Many people make the mistake of placing too many small images on a page, rather than featuring your “hero images” and supplementing them with other favorites. Too add to the cliches, sometimes more is less! If you have to bend your neck to view the family portraits on your walls, you’ve hing them too high. Generally, you don’t want to have to look up at your artwork whether you are sitting or standing. Of course, there’s some leeway here depending on the portrait’s style and size and the distance from which your pictures will be viewed. Instead, hand your wall portraits (and mirrors) at eye level, which is usually about 60 inches from the floor. Ideally, if the centers of your images are hung at this height, they are also printed large enough so that the images will reach the tops of the door frames, making them easy to view and feel proportional to the other features of your home. When you are hanging your images lower, like over a couch or counter top, the rule of thumb is to hang the image so that it sits six inches above the top of your furniture. And when you are hanging images in your dining room, you may want to hang them slightly lower because they are more likely to be viewed while sitting at your dining room table. 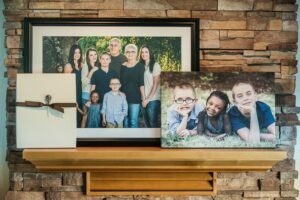 How big or small your family portraits should be depends on how and where you want them to be displayed. A picture sitting on a desk that will be viewed by a person sitting a few feet away doesn’t need to be as large as the image hanging in your living room that be enjoyed from across the room. While an 8×10 print might be appropriate for a desk or narrow hallway, but that same size will look incredibly small and awkward hanging on the wall of a larger room. Choosing the right size for the family portraits on your walls doesn’t have to be difficult if you follow a few rules of thumb. Mathematically speaking, a photograph is best viewed at a distance that is no more than three times the length of its hypotenuse. Okay, okay, Here’s the english translation. All you need to do is determine the length of your desired portrait diagonally (don’t include the frame). Then, multiply that length by three and you have the maximum distance from which it should be viewed. For most homes, that means that your ideal size will be at least a 16×24, and often much larger. When in doubt, my advice is always to go with the larger size. It’s very rare that a portrait hanging on a wall will feel to large unless the heads of the people in the photographs are larger than real life. 9 times out of 10, people regret not choosing the next size up. And do yourself a favor. Reserve the 4x6s, 5x7s and 8x10s for your photo albums or for small frames that you set on a desk or small shelf. They will almost always create a cluttered look and are just too small to look great on your walls at home. The exception is for 8x10s and 11x14s when they are a part of a larger wall collage. As mentioned above, I have technology that can help you visualize what your portraits will look like hanging on your actual walls at home. Give me a call if you need advice or help choosing the best products that will match the character of your home. If you have a fireplace in your home, it is undoubtedly the focal point in the room and the perfect place to show off your family portraits. As a general rule, if you hang photographs above your fireplace—whether you hanging a single piece or a collage of images—you should try to make the total size of the grouping be about the same size of the fireplace opening. This will give your images a look that is proportional to the rest of the fireplace and your room. For mantels, beautifully framed prints on stands can give a polished look. Or, one of my favorite products is the “photo shelfie.” Photo shelfies are wooden blocks that have a slit carved at an angle down the center. They sit on your mantel and hold three images that are printed on metal or photographic paper that are mounted on thick styrene. 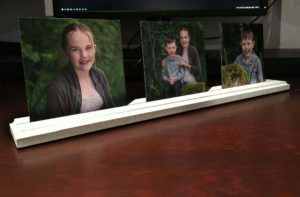 Photo shelfies are a great way to beautifully show off your favorite images, and best off all you can easily switch out your photographs with the season or as the kids grow older. Photo shelfies aren’t just for fireplaces, either. They work great for dressers, hutches, tables and more. Nowadays home decorating ideas are just a click away. In particular pinterest is always a great place to find inspiration, not just for home décor but for family portrait locations, style, and posing ideas too. I always encourage my clients to use these types of resources for ideas and inspiration. But, my advice is not to go to these sites looking for something to copy. Instead, look for the elements you enjoy and find interesting, and work them in as elements of your own style.